This banana bread recipe has been tweaked for a much healthier nutritional profile yet it remains moist and flavorful. A perfect after school snack for children. 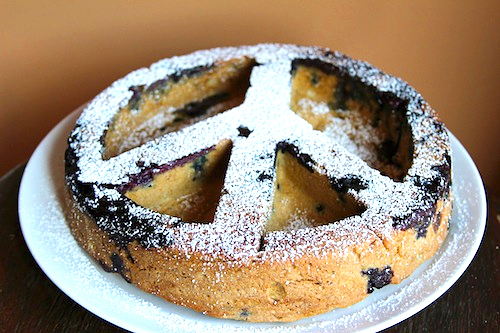 As seen in the picture, this recipe was used for my daughter’s Peace sign cake pan but any standard loaf pan would work. This banana bread recipe has been tweaked for a much healthier nutritional profile yet it remains moist and flavorful. A perfect after school snack for children. As seen in the picture, this recipe was used for my daughter’s Peace sign cake pan but any standard loaf pan would work. Using oat flour adds a natural source of heart healthy soluble fiber. Blueberries are leaders in antioxidant activity as well as adding fiber, vitamin C and manganese. Using applesauce instead of butter helps to decrease the fat content. This coupled with the bananas, yields a moist product. A healthier version of a traditional favorite. In a large bowl, mash bananas with a fork or beat well. Add the honey and eggs to the bananas beating until smooth. Add the applesauce, vanilla, and sugar combining well. Add the spices, baking soda and flours and stir until well combined being careful not to overmix. Toss in the blueberries and gently fold into the batter. Pour the batter into the prepared loaf pan and bake on center oven rack for about 50 minutes (until inserted tooth pick comes out clean). Add another 10 minutes to the baking time if the bread is not fully cooked. If the top is getting browned, simply place a piece of tinfoil over the top. If using the silicone molds, timing will vary significantly so keep an eye and check every 5-10 minutes after the half hour mark. (Our peace sign mold only took 35 minutes since it is very thin in some areas). Remove the bread from the oven and allow it to cool for 10 minutes before turning it out of the pan onto a rack to cool completely.